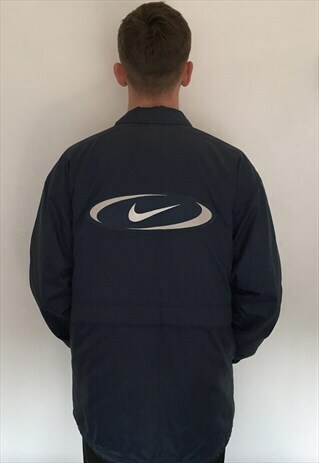 One of a kind Vintage Nike Spellout Logo Coat. Grab a steal! Size Large. Model here is around 6ft. Condition is great considering its age. Unfortunately its removable hood is not with it, no other flaws however. (Please note: all our items are vintage and may show minor signs of vintage wear, however anything else will be mentioned in the description above). Coat is in great condition. Removable hood is not with it however.